I’d like to introduce PETUNIA, the newest Ltd. Edition Fairy. 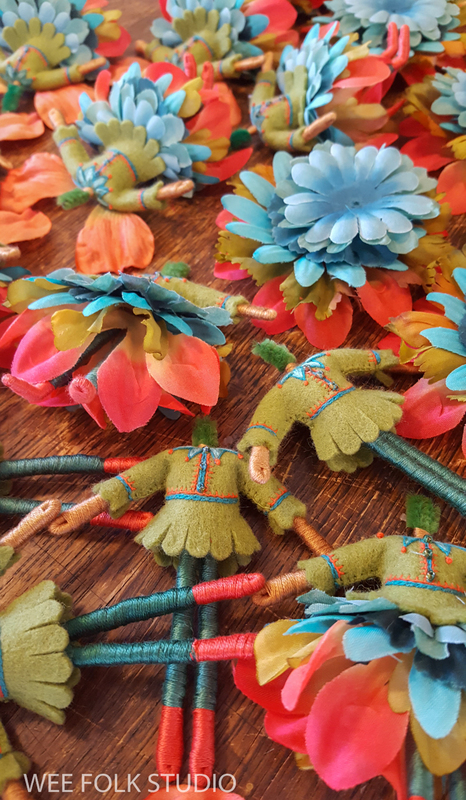 The group of 25 dolls have been traveling around with me for about 6 months and finally they are all dressed, coiffed and winged! 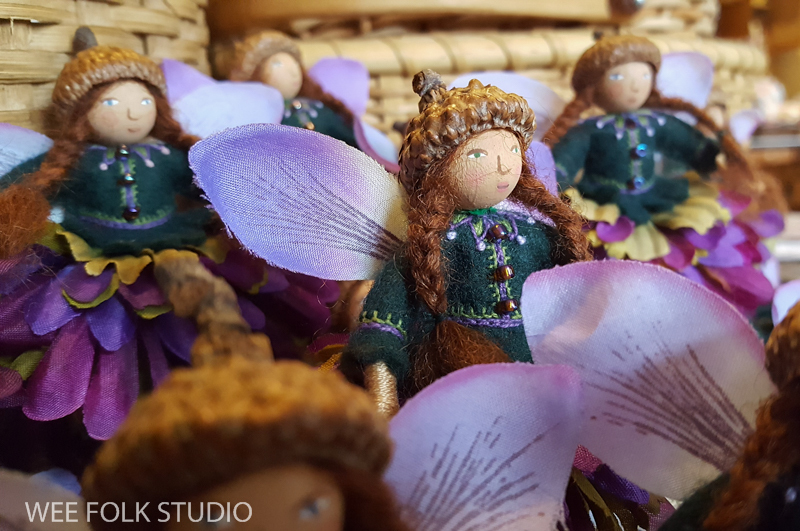 The fairies will be ready to fly off from my Etsy Shop to their new homes on Saturday, Dec. 1, 2018 at 10 AM (Eastern US time). They will be sold on a first come, first served basis. Sorry, no reservations ahead of time. I realize that the hour of the day is in the middle of the night for those of you on the other side of the world, but I can’t figure out how to make it perfectly fair. I started making this group while in Scotland last spring. 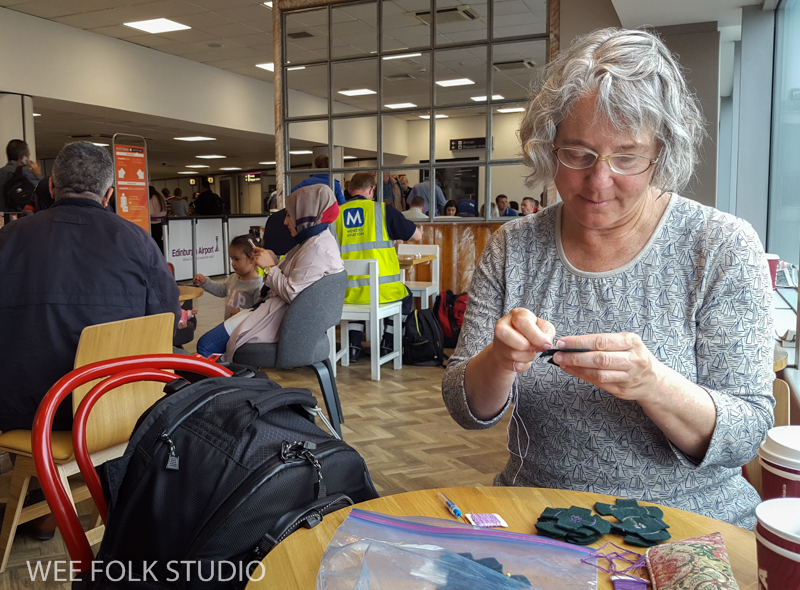 Here I am in the Edinburgh Airport, sewing their felt tunics while waiting for my plane. As with all of the Ltd. 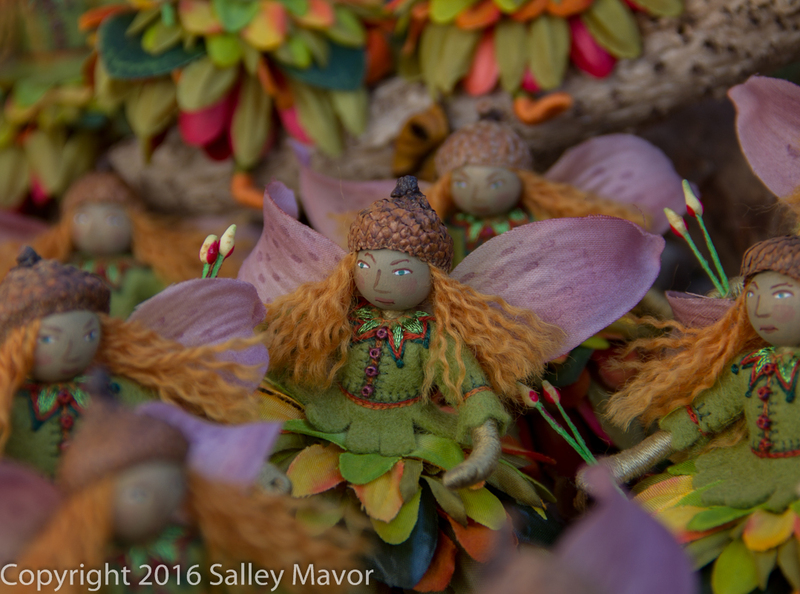 Edition Fairies, I only work on them while traveling, when there are long stretches of time to fill going from one place to another. The photo reminds me of a drawing I made of my mother many years ago. 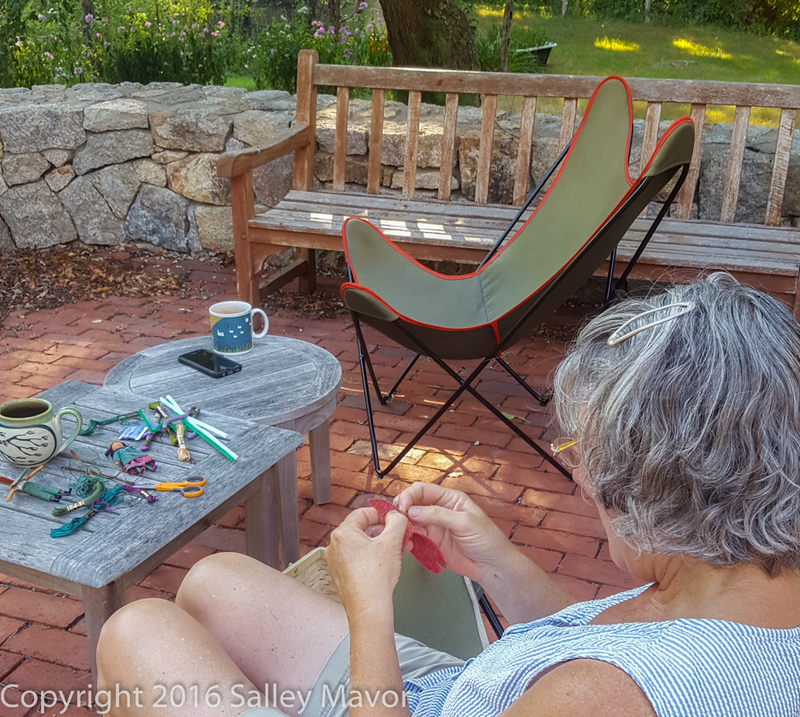 She is knitting one of her signature hats featured in my sister Anne Mavor’s 2006 article, “My Mum’s Fair Isle Hat” which she wrote for Interweave Knits Magazine. I wrote about it in this Blog post. I suppose we are all destined to become our mothers in some way! 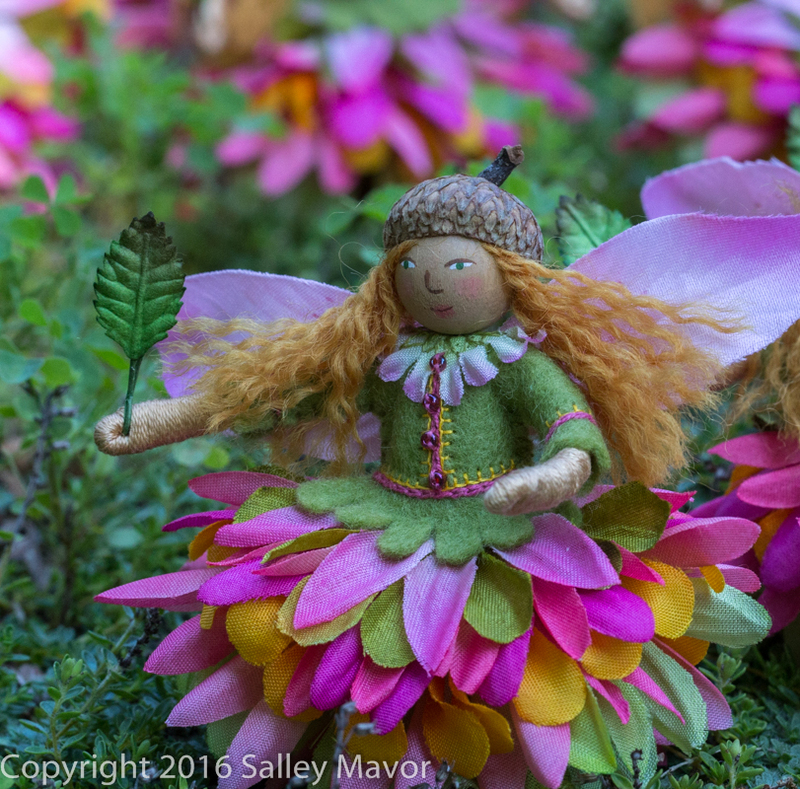 As you can see, I haven’t weened myself entirely from making fairies. It’s a nice relaxing, portable activity when traveling. I’ve had to put limits on myself at home or else I would make them all the time, instead of pushing myself to do new work. To see this and the other fairies in the archives, click here. 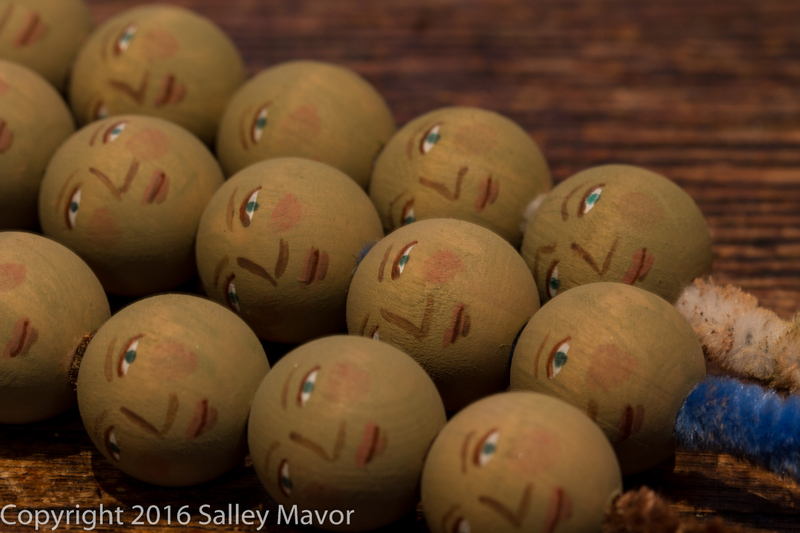 So, 1 or 2 times a year, I complete a group of 25 dolls and offer them in my Etsy Shop. 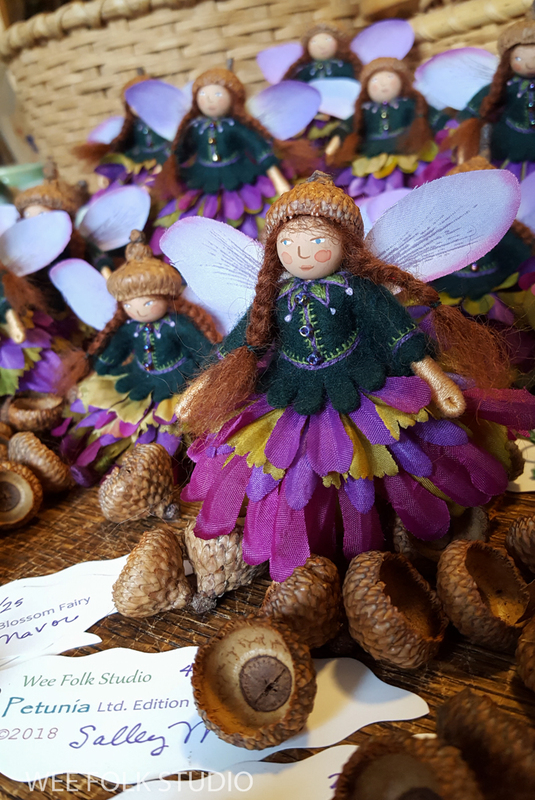 They’re basically the same fairies from my how-to book of dolls, Felt Wee Folk – New Adventures. 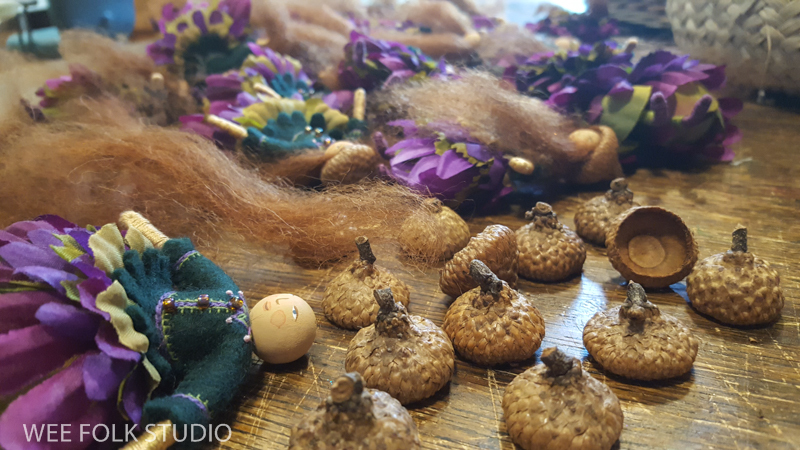 The only potentially messy part is gluing on their hair and acorn caps, so I usually do that in my studio. The hair is wool fleece, which I’ve just added as a multi colored sampler to my Etsy Shop. During a recent long car ride, I braided their hair and sewed on their wings while sitting in the passenger seat. 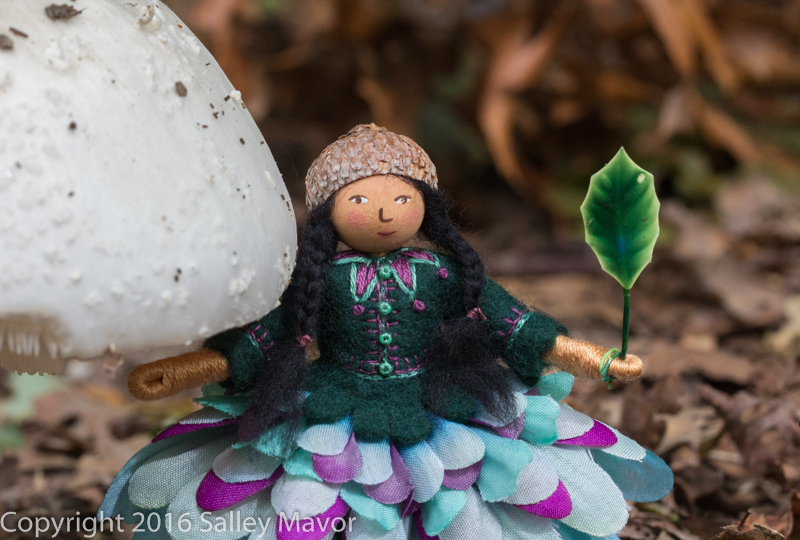 PETUNIA is 3 3/4″ tall, with braided chestnut hair, acorn cap hat, hand embroidered wool felt tunic and petal skirt. 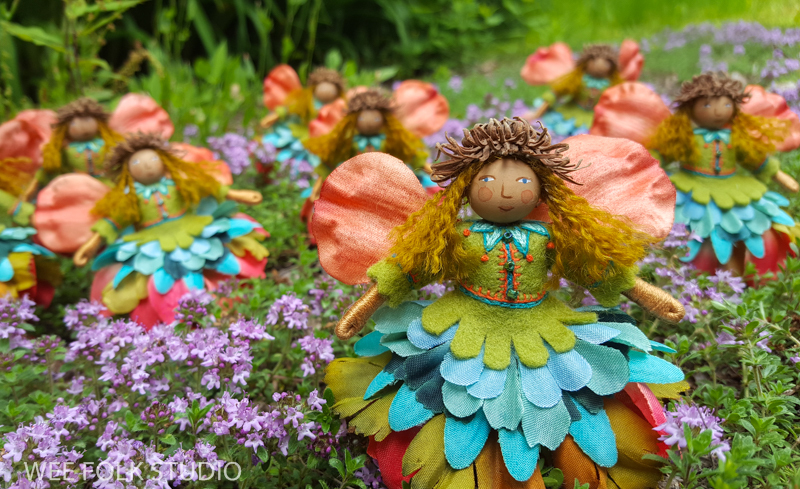 Each doll is one of a limited edition of 25 look-alike fairies. They each sell for $85.00 and come with a signed and numbered name tag. To enter my shop, click here. 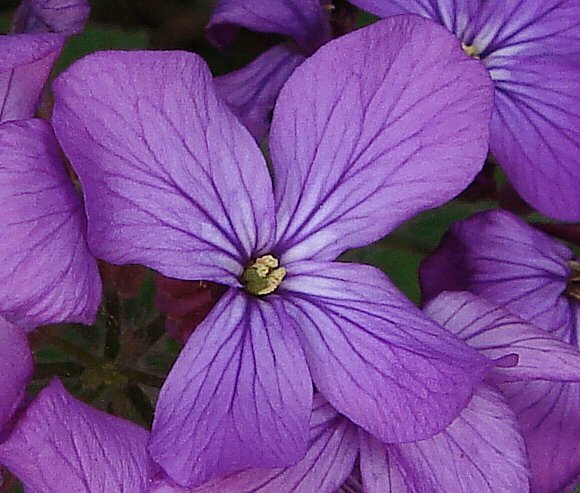 PETUNIA will be added on Dec. 1 at 10 AM. Good Luck! 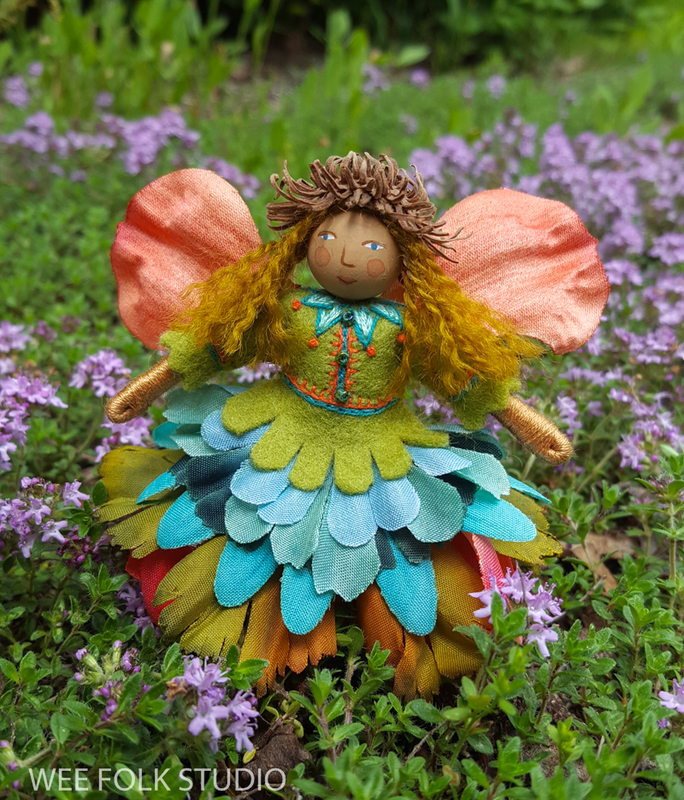 Please meet HONEYDEW, the newest Blossom Fairy! 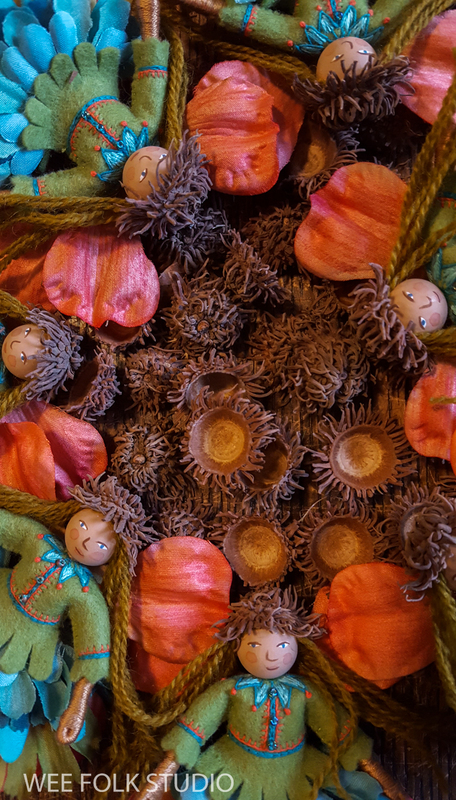 She is 3 3/4″ tall, with crimped blond hair, spiky acorn cap hat, embroidered wool felt tunic and petal skirt. 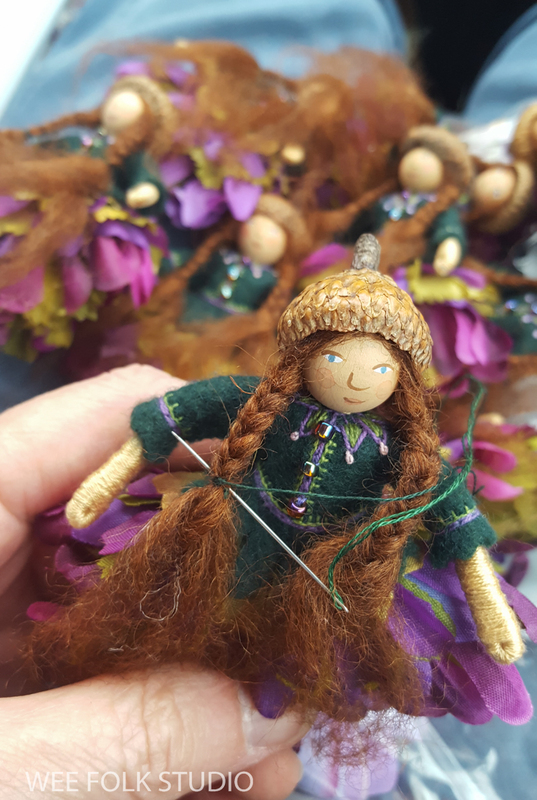 I don’t sell one-of-a-kind dolls, but every once in a while I offer a ltd. edition of 25 dolls similar to the ones in my how-to book, Felt Wee Folk. You see, I only work on them outside of my studio, while traveling, so there’s no predicting when a set will be finished. This is my way of controlling the urge to make them all the time. As some of you’ve discovered, making wee folk can become addictive! That isn’t such a bad thing, but if I succumbed to the impulse, I would be less inclined to commit to long term projects like our animation Liberty and Justice or the children’s book I’m working on right now. To see previous ltd. editions in the archives, click here. Information about purchasing HONEYDEW is at the end of this post. 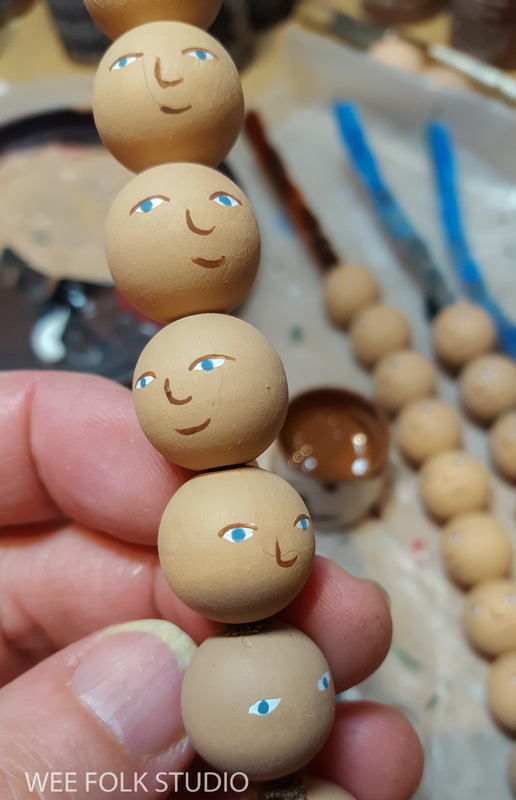 When painting their heads, I slide the wooden beads onto a pipe cleaner, so they won’t roll around. 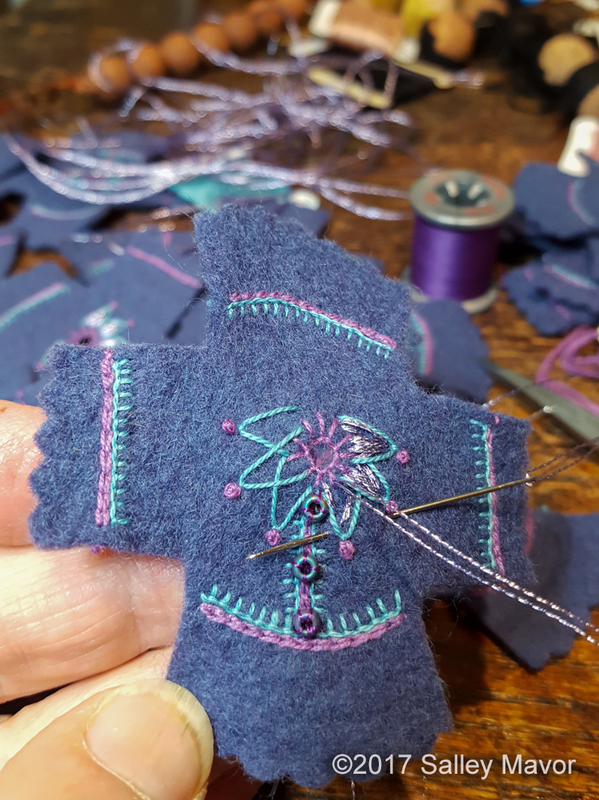 Their felt tunics are small and portable, which makes them easy to work on while traveling. 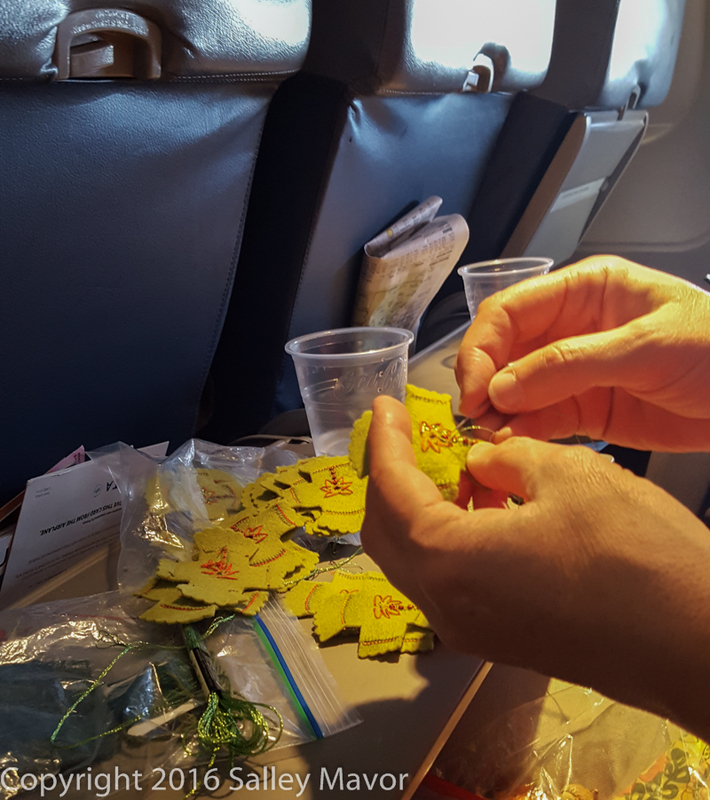 Airplane stewardesses are always curious about them! Wrapping their pipe cleaner bodies is another portable activity. 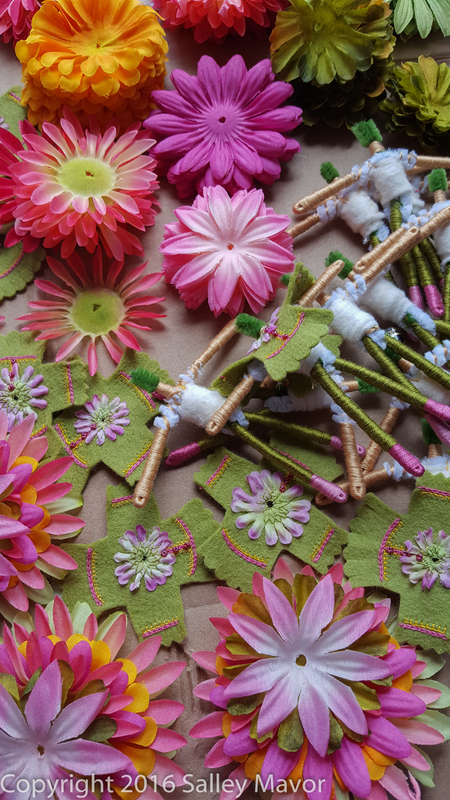 I usually dress them in their petticoats at home because it requires room to spread out the petals. 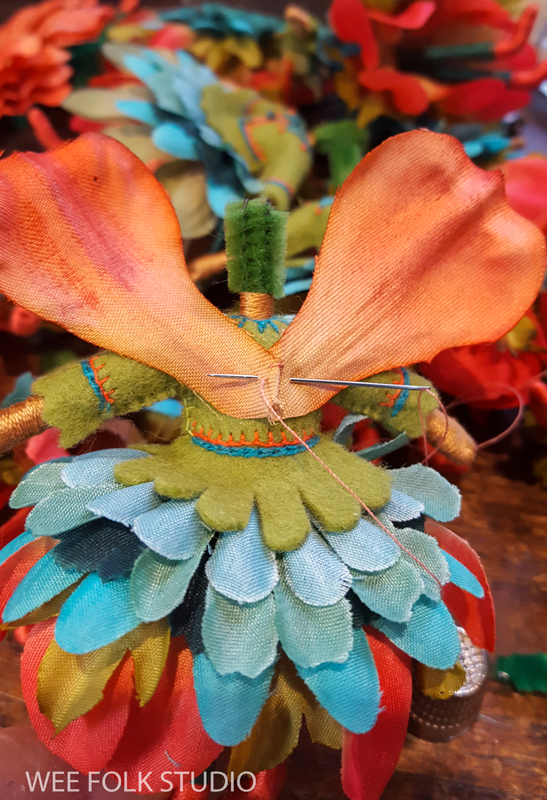 Their wings are sewn onto the back. 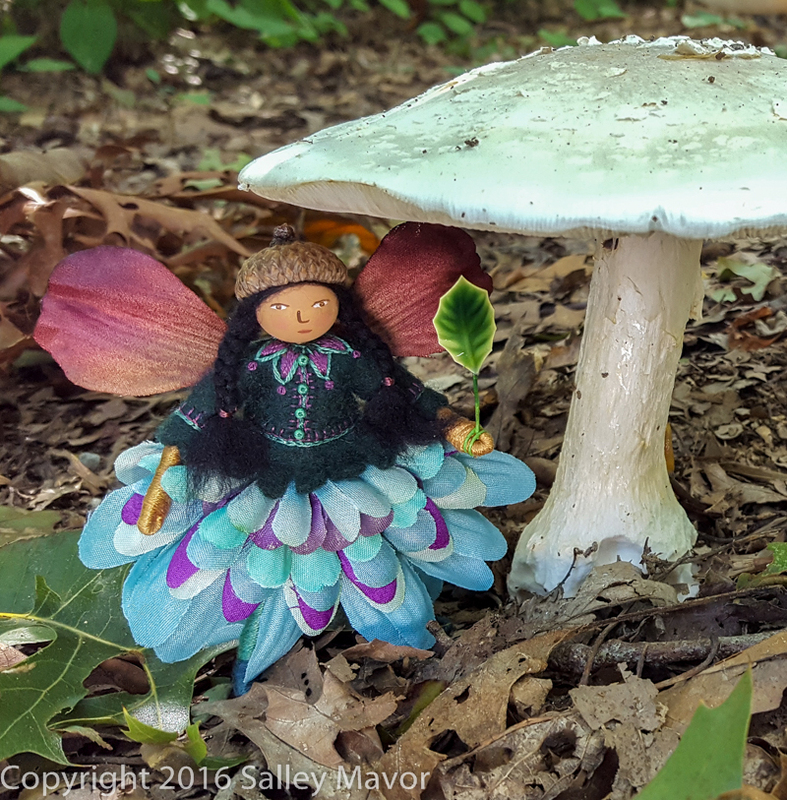 HONEYDEW has a different variety of acorn cap than previous fairies. This collection of spiky burr oak caps were sent by a fan in Georgia. 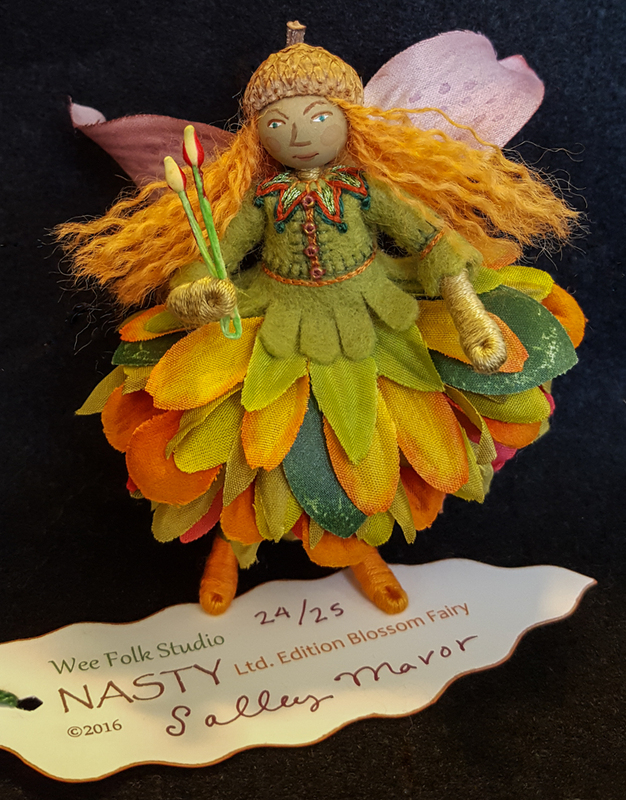 Of course, she will be getting a fairy as a thank you gift. 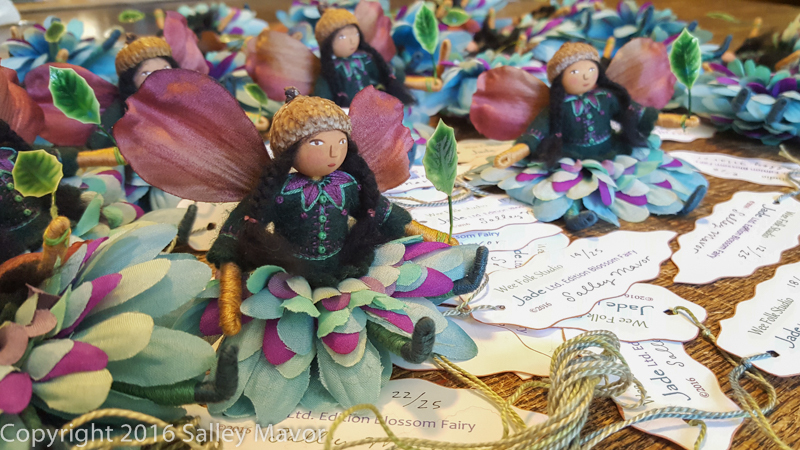 Each fairy will have a signed and numbered tag. 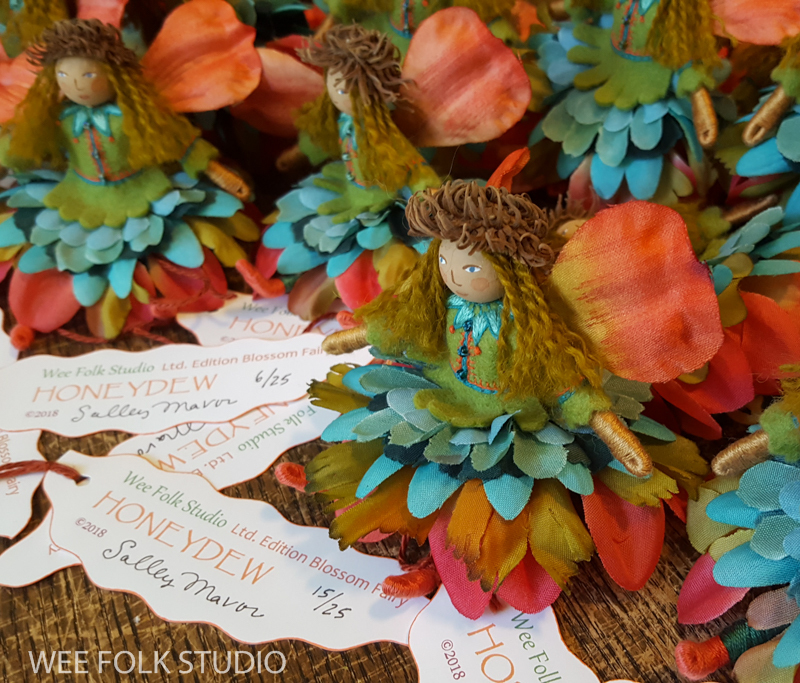 In an effort to be fair to everyone, the sale of 25 HONEYDEW dolls will be announced on this blog, Facebook and Instagram. They will be listed for $75.00 each in my Etsy Shop on Sunday, June 17th at 10 AM, eastern US time. That gives more of you a chance to read about it in advance, so you can plan on being ready to shop. I’m sorry if this hour isn’t convenient for other time zones around the globe, but I can’t figure out how to accommodate everyone. The last edition sold out very quickly, so if you really want one, act fast! Sorry, no reservations ahead of time. 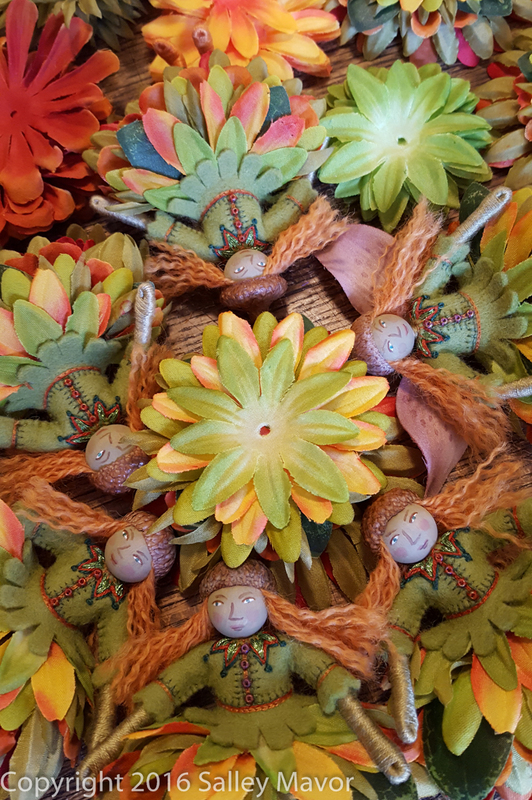 The dolls will be sold on a first come first served basis. 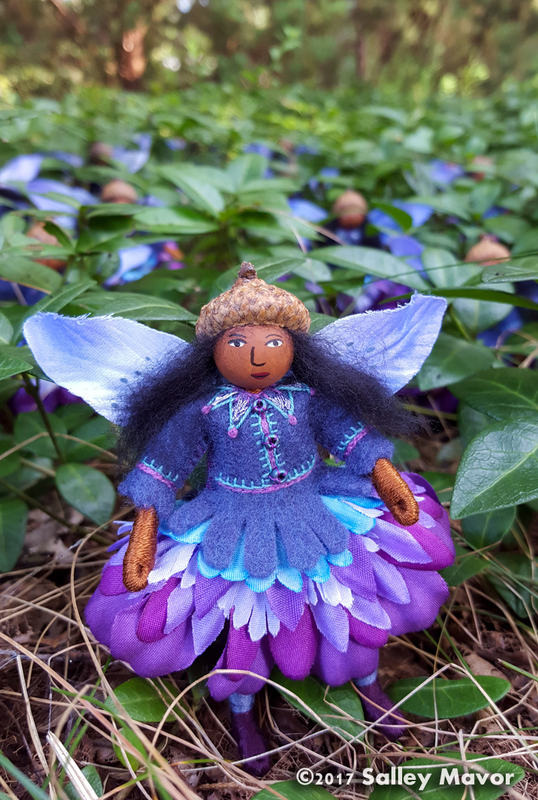 Please meet HONESTY, the newest Blossom Fairy! 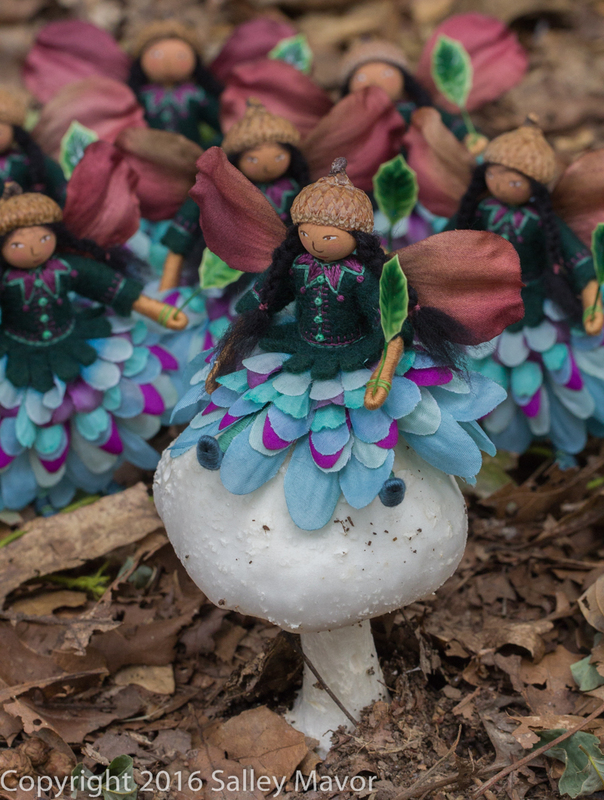 She is 3 3/4″ tall, with long black tresses, acorn cap hat, embroidered wool felt tunic and petal skirt. 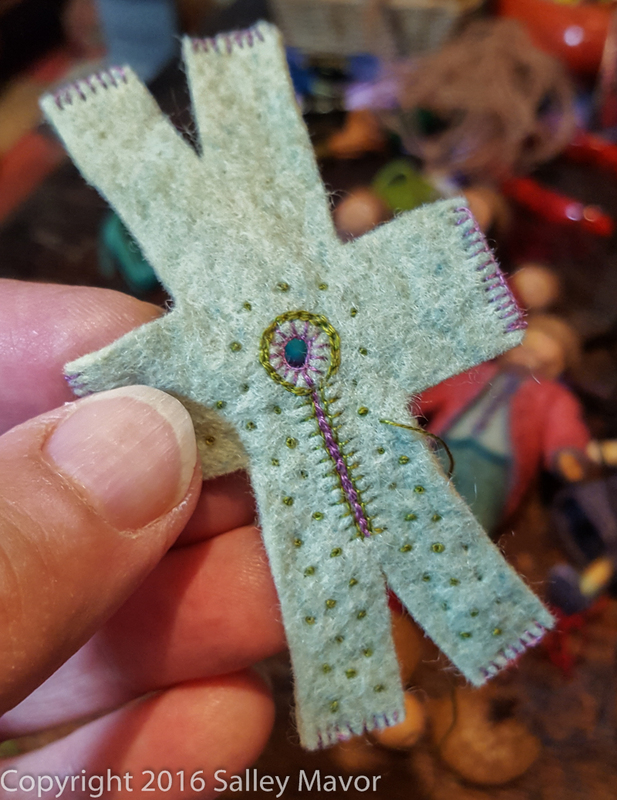 I don’t sell one-of-a-kind dolls, but every once in a while I offer a ltd. edition of 25 dolls similar to the ones in my how-to book, Felt Wee Folk. You see, I only work on them outside of my studio, while traveling, so there’s no predicting when a set will be finished. This is my way of controlling the impulse to make them all the time. That isn’t such a bad thing, but then, I would be less inclined to make new, more involved pieces or get myself into the political fray! To see previous ltd. editions in the archives, click here. Information about purchasing HONESTY is at the end of this post. 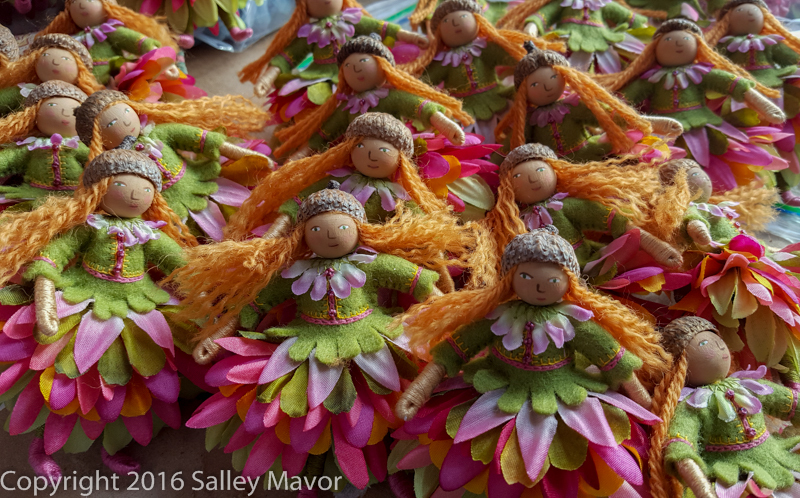 Each doll has a signed and numbered name tag. 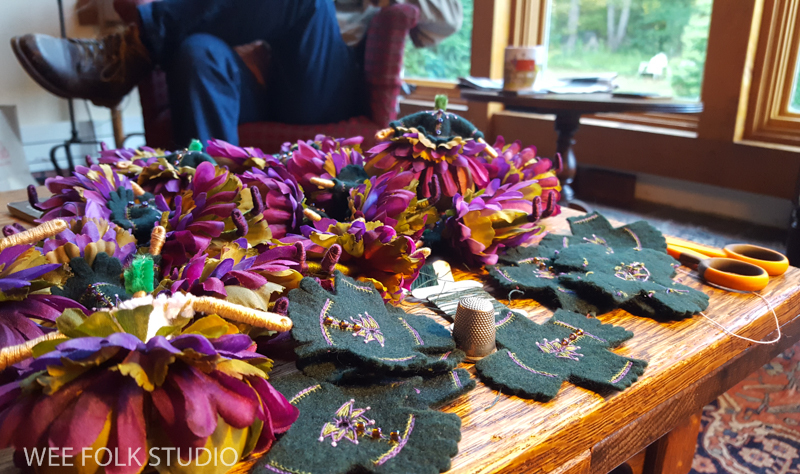 I put the finishing touches on the tunics in my studio, but most of the embroidery was done in airport waiting rooms, on board planes and in the car on long drives. Sometimes they look like a flock in uniform, preparing for a mass take off. 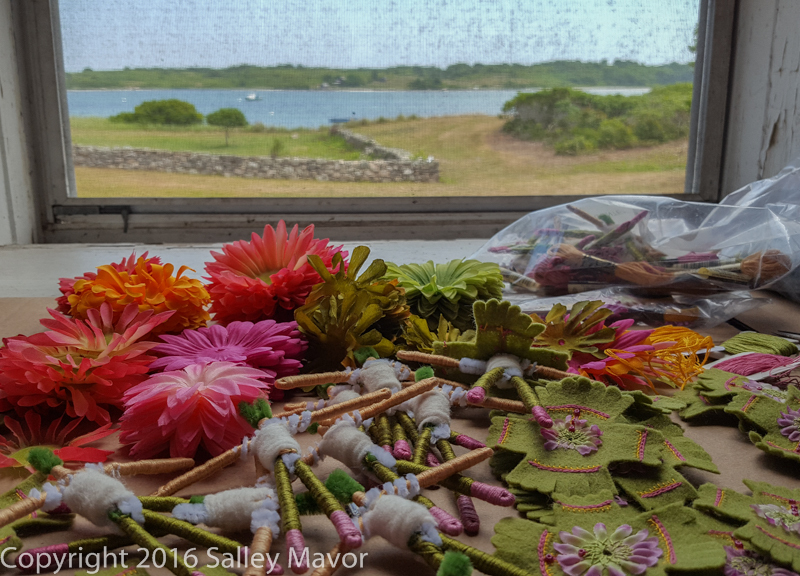 I make sure in advance that there are enough petals to make 25 petticoats. 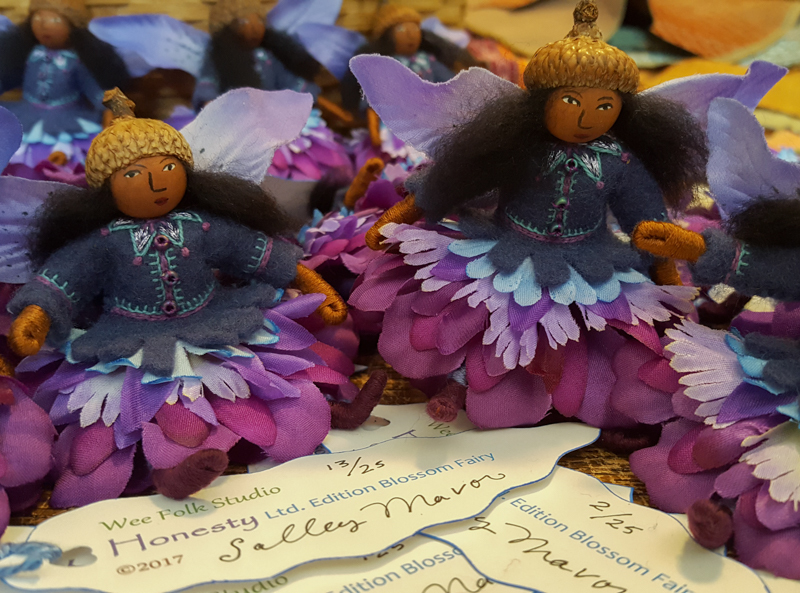 Information about purchasing a fairy: In an effort to be fair to everyone, I am announcing on this blog, Facebook and Instagram that 25 “HONESTY” fairies will be listed for $75.00 each, in my Etsy Shop on Saturday, September 2 at 10 AM, eastern US time. That gives more of you a chance to read about it in advance, so you can plan on being ready to shop. I’m sorry if this hour isn’t convenient for other time zones around the globe, but I can’t figure out how to accommodate everyone. The last edition sold out very quickly, so if you really want one, act fast! Sorry, no reservations ahead of time. 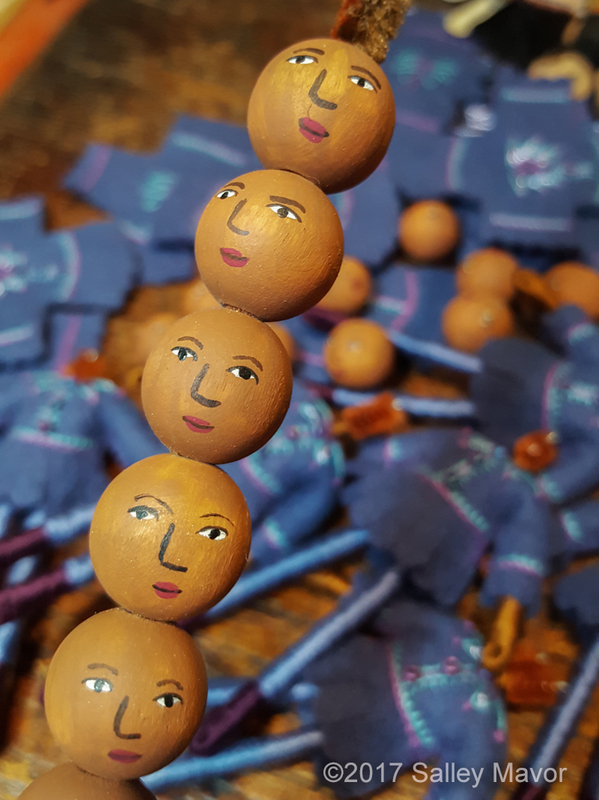 The dolls will be sold on a first come first served basis and can be shipped anywhere in the world. 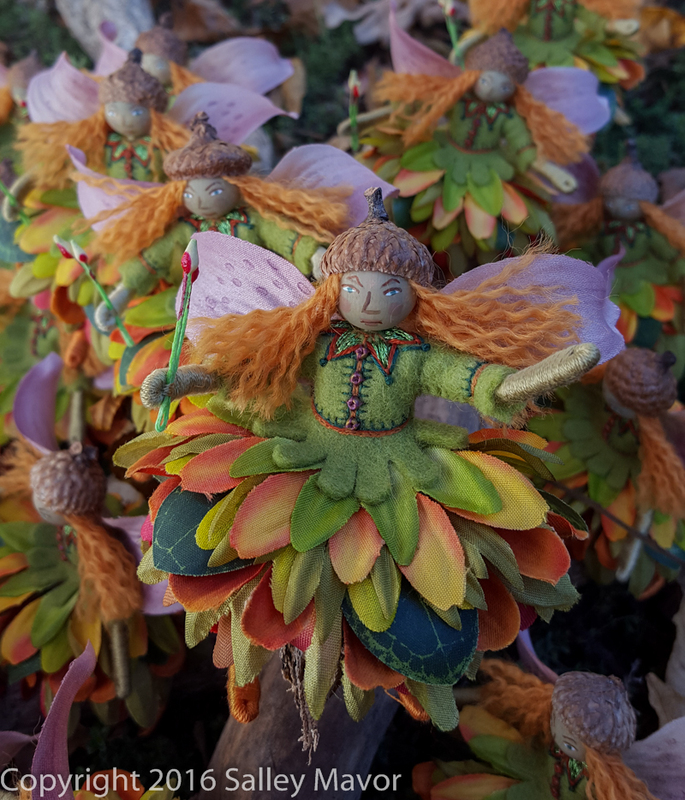 And don’t miss a chance to win the FAIRY FAMILY RAFFLE to benefit of Highfield Hall and Gardens. Tickets ($5.00) may be purchased online here. 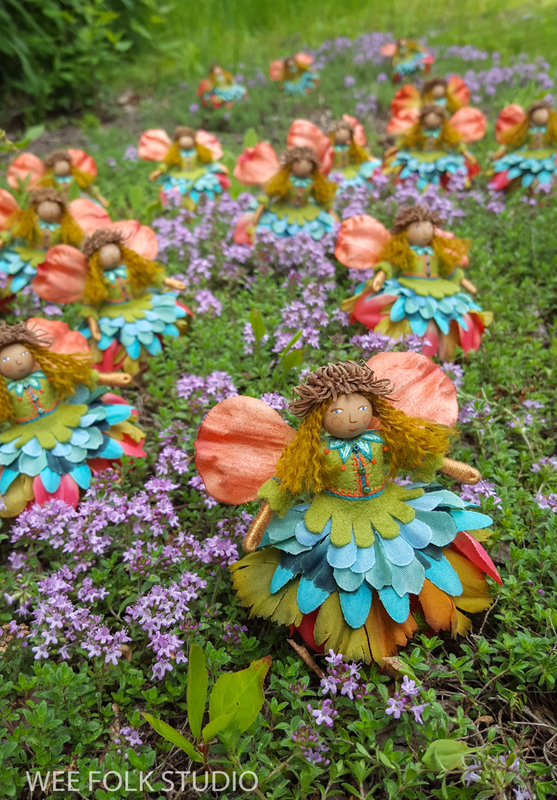 The winner will be picked on Sept. 4th and the Fairy family will fly to their new home! 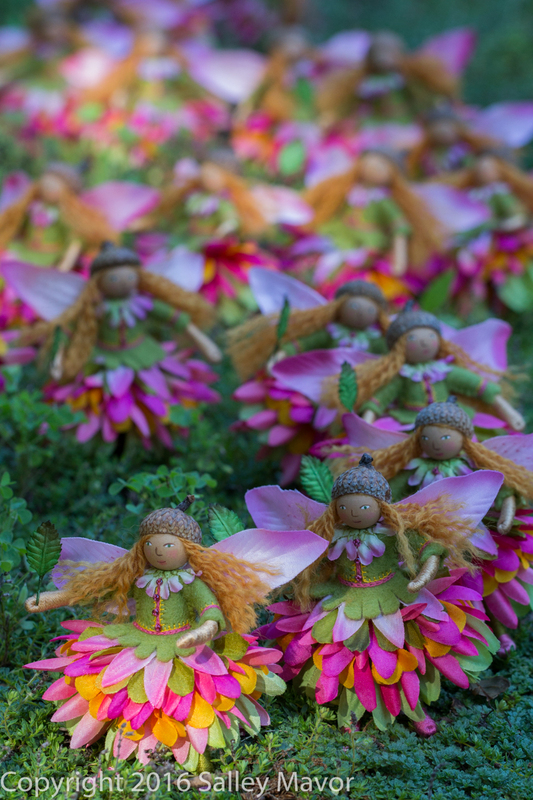 The NASTY Fairy Force is eager to take flight and follow their important humanitarian mission. This special unit has been assigned to uplift the disheartened and guard against bullying and harassment in the homeland and overseas. NASTY may look cute, but can she sting! 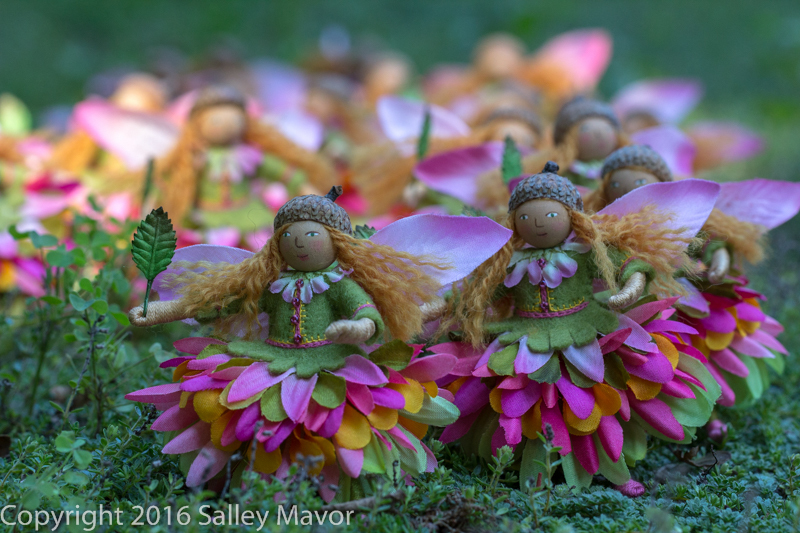 The swarm of 25 fairies will be deployed on Saturday, Nov. 19th at 10 AM EST, in my ETSY shop. First come, first served. Months of preparation have led up to their readiness, with an extra push at the end to help meet this week’s emergency call for action. May the Fairy Force be with you! I am very pleased to introduce the 5 members of the Frost Family. Mom, Dad, brother, sister and baby are all dressed warmly for the coming winter. 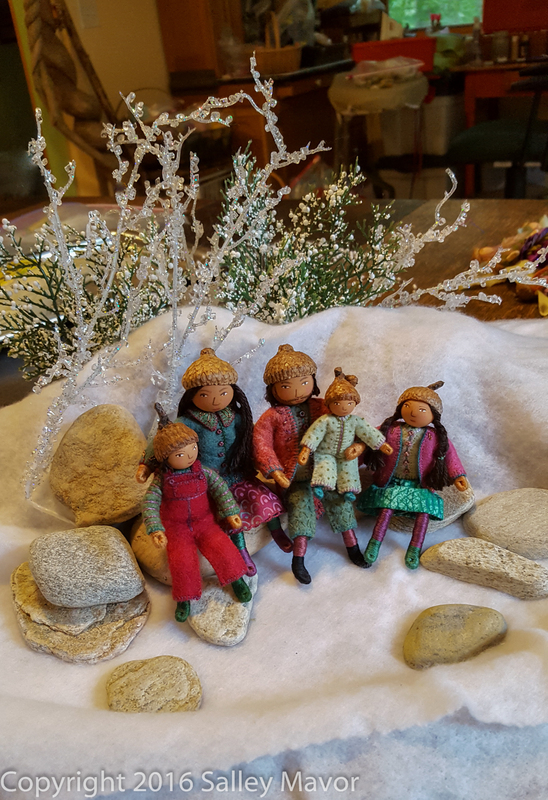 They are doll-house sized, from 4.5” to 2.5”, with hand embroidered wool felt outfits and acorn capped painted wooden heads. 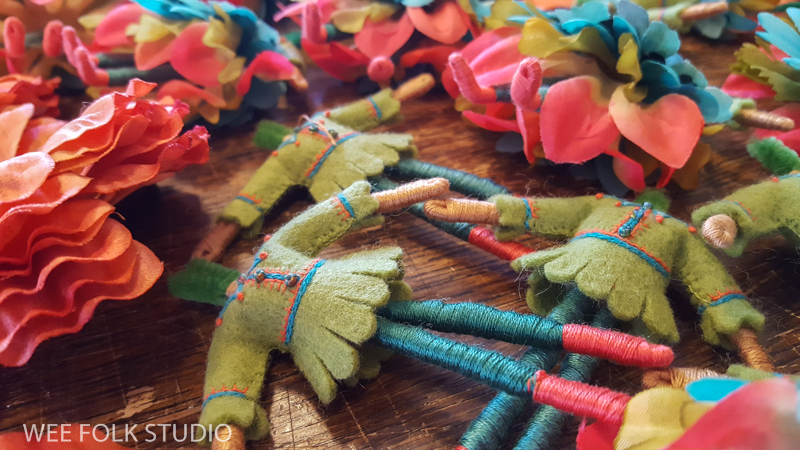 Even though they are sturdy enough to be played with by children, they aren’t just for children and can be appreciated by all ages. 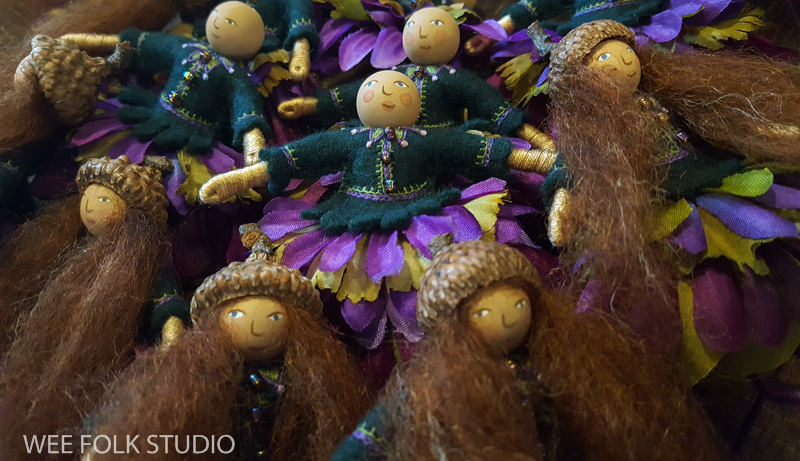 Every once in a while I make a group of related wee folk dolls and offer them as a fundraiser for a local non-profit organization. 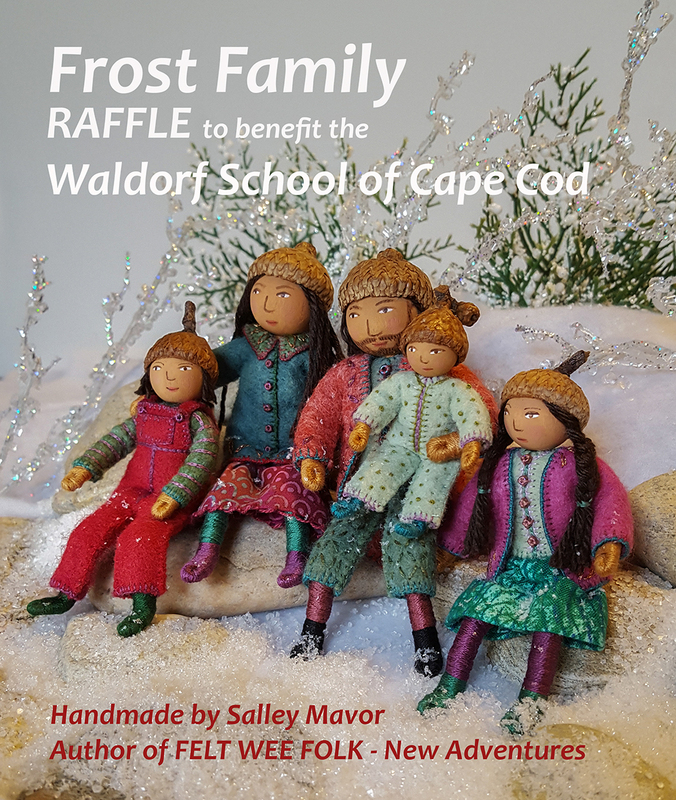 The Frost family will be raffled to benefit the Waldorf School of Cape Cod. 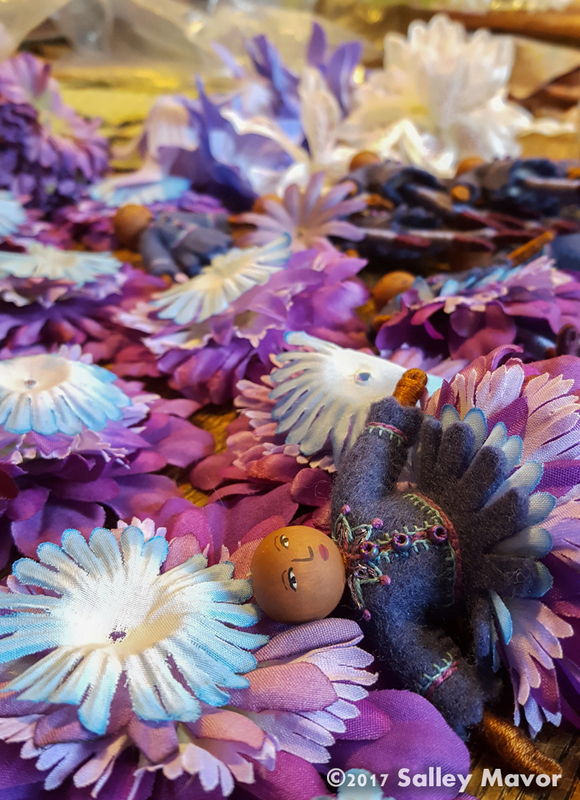 If you visit this blog regularly, you’ll know that I don’t sell one-of-a-kind dolls, so this is a rare chance to have a unique family of wee folk, all hand-stitched by yours truly. Raffle tickets ($5.00 each, 5 for $20.00) may be purchased online here. The raffle is open to all world-wide and the prize will be sent to the winner, where ever they live. 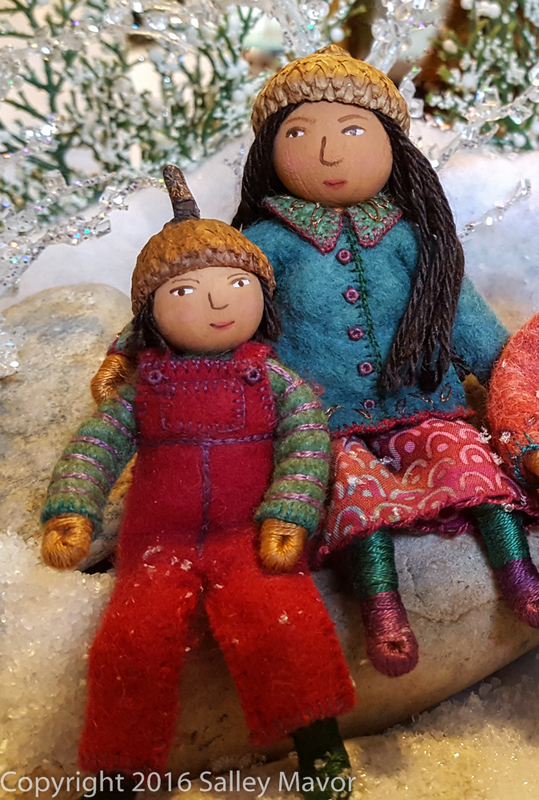 I made the dolls and stitched their wool felt clothes over the summer. 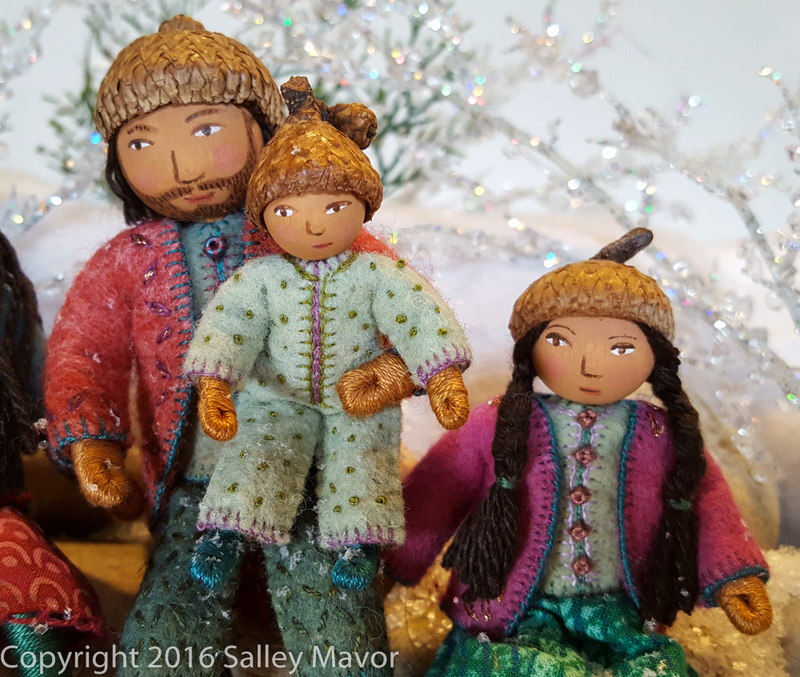 I just loved picking out the felt colors for the Frost Family’s warm winter clothing. 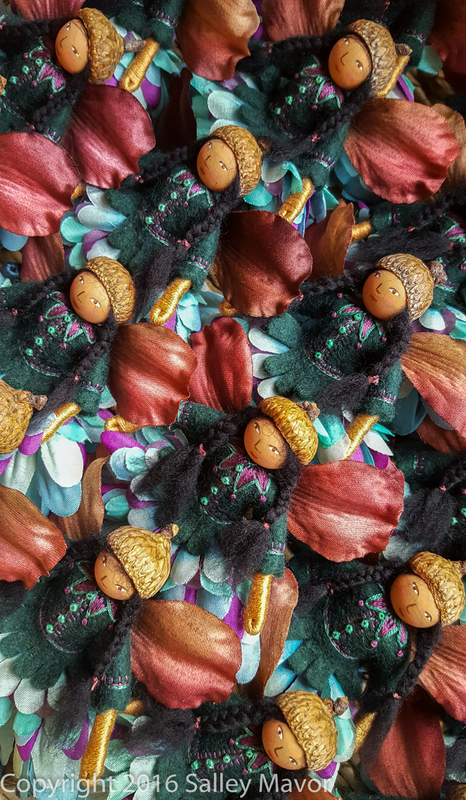 They are a variation of doll house sized dolls from my how-to book, Felt Wee Folk: New Adventures. 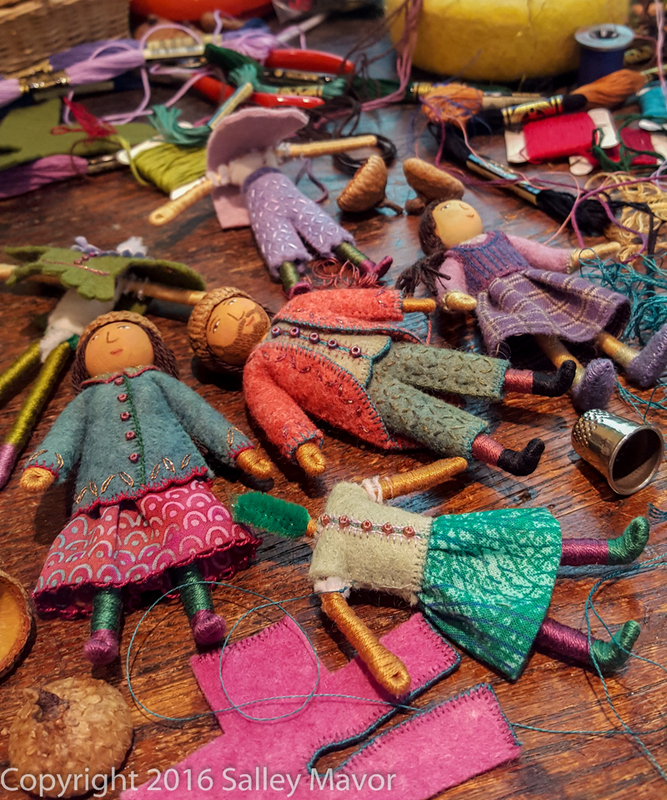 The doll armatures are extra sturdy (as taught in the book), so as to hold up better to multiple posing and general play by children (or adults). 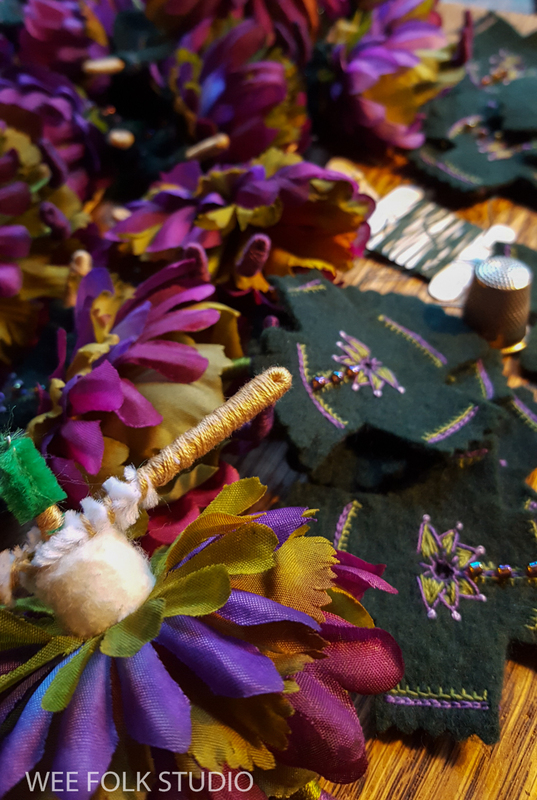 I added sparkling accents with metallic thread. French knots make polka-dots on the baby’s jump sit. Here’s the set-up for the Frost family’s photo shoot, before “snow” (kosher salt) was sprinkled around. 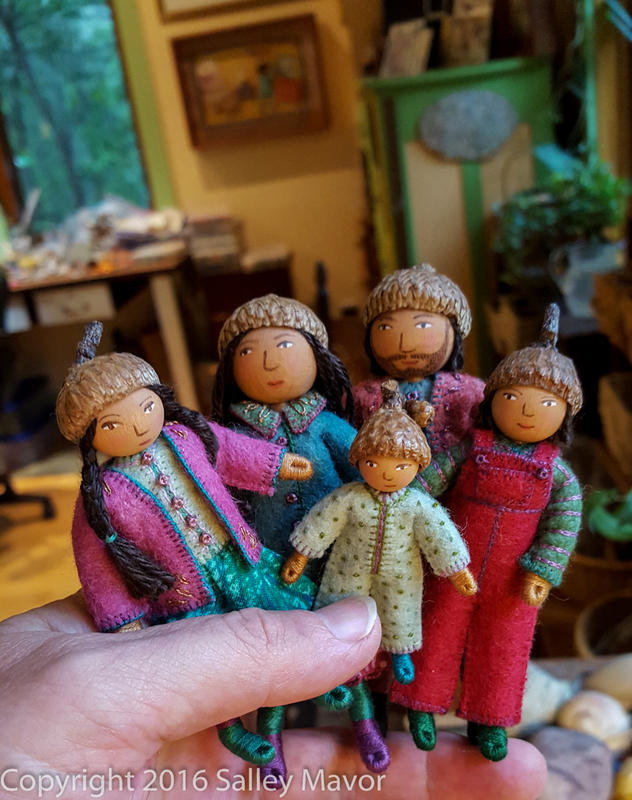 The Frost Family is on display at the Waldorf School of Cape Cod until the raffle drawing, which will be during their popular Holiday Faire on Sat., Nov. 19th. Raffle tickets may be purchased online here. Good luck! 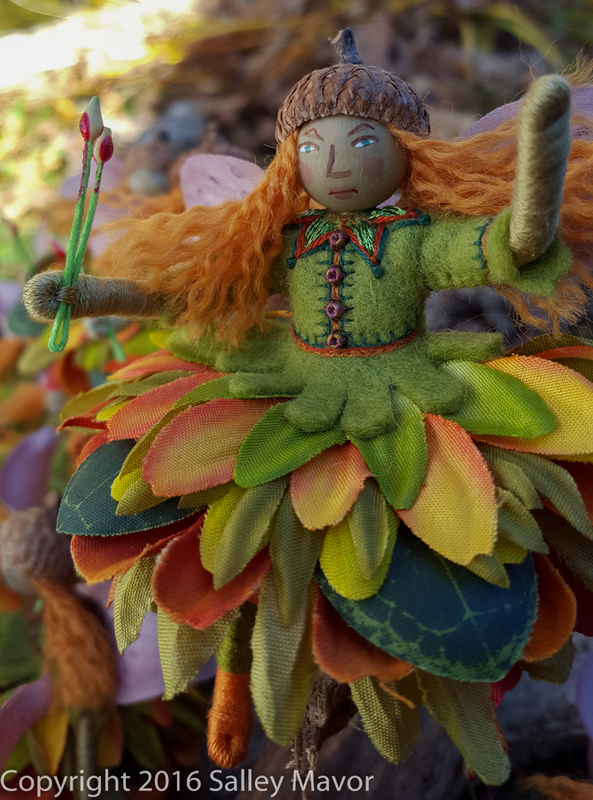 Please meet JADE, the newest Blossom Fairy! 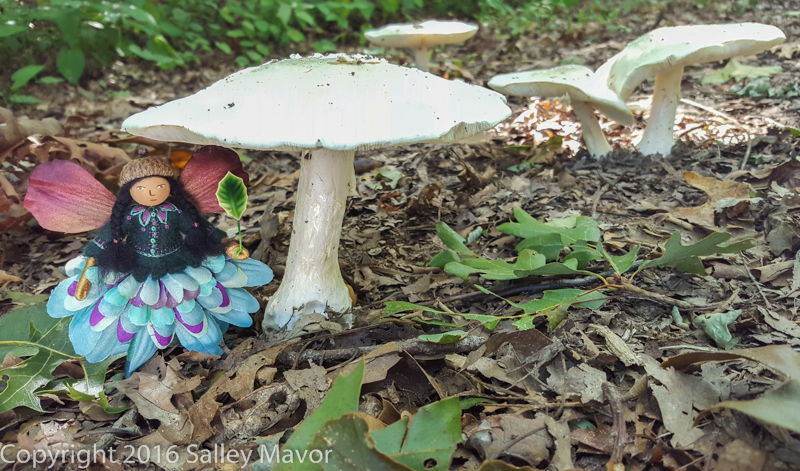 She is 3 3/4″ tall, with long black braids, acorn cap hat, embroidered dark green wool felt tunic and petal skirt. 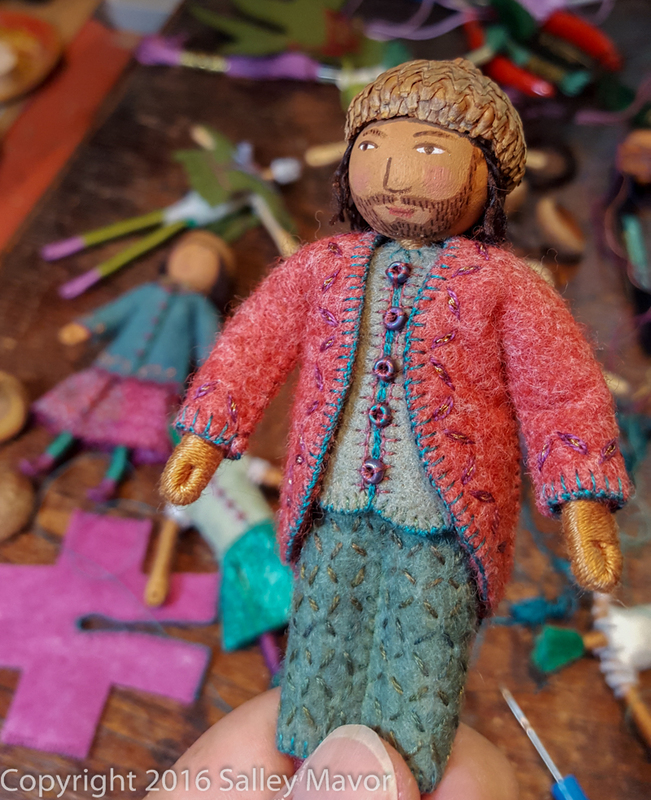 Even though I’ve said that I don’t sell them, every once in a while I offer a ltd. edition of dolls similar to the ones in my how-to book, Felt Wee Folk. 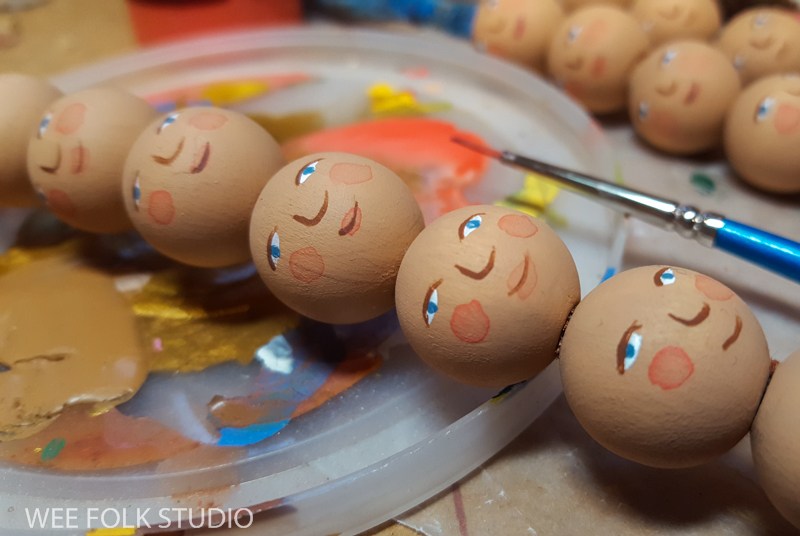 You see, I only work on them outside of my studio, while traveling, so there’s no predicting when a set will be finished. To see previous ltd. editions in the archives, click here. 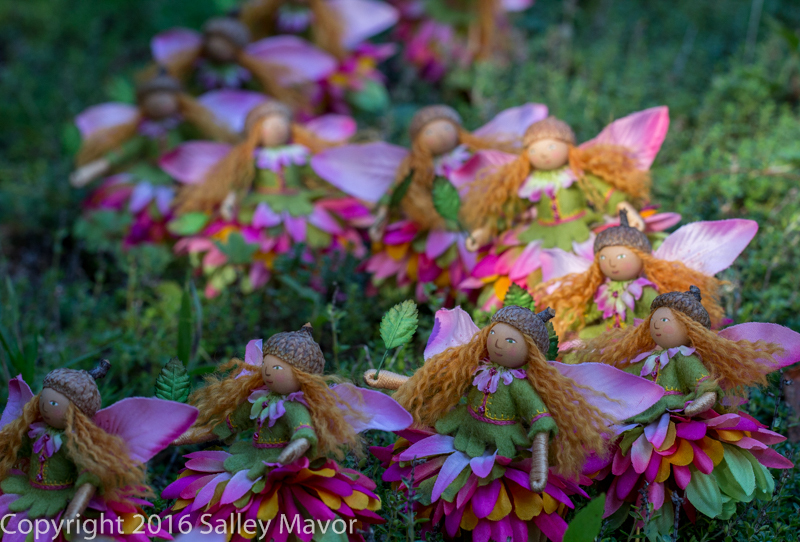 In August, a ltd. edition of AZALEA Fairies that I’d gradually been making over the year were sold my Etsy Shop. 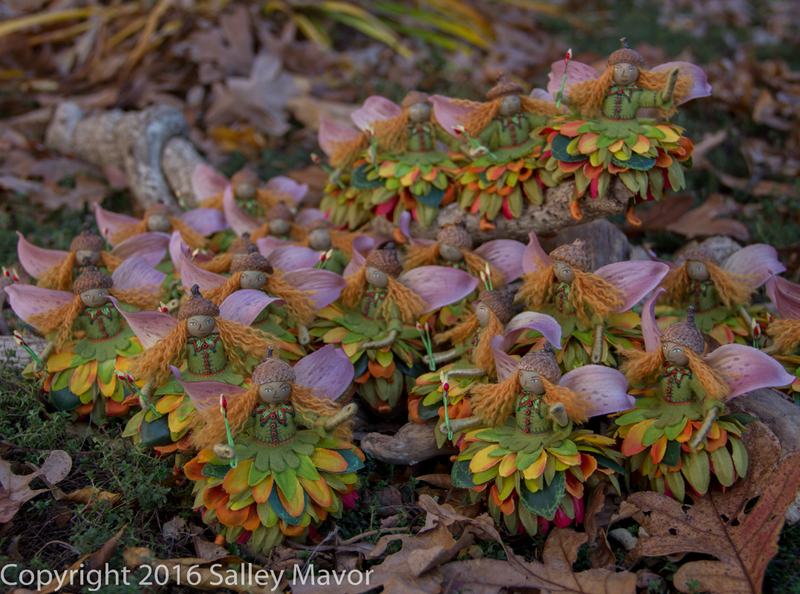 They’re usually not finished so close together, but this past summer, I made a set of 25 look-alike JADE Fairies while on vacation. Luckily, a patch of white toad stools appeared along the road in front of my house about the time they were finished. So naturally, that’s where they had a photo shoot. 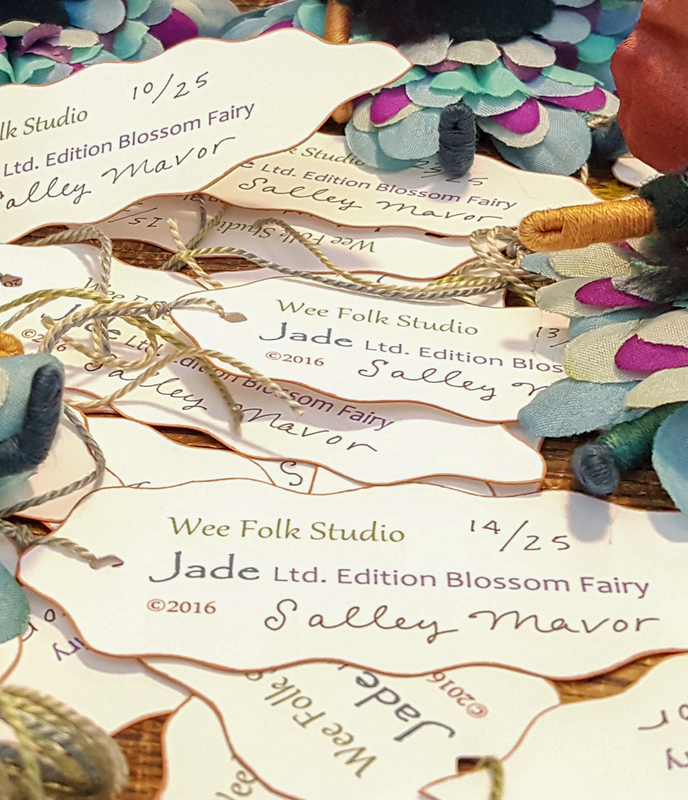 Please see information about when and how to order JADE Fairies at the end of this post. 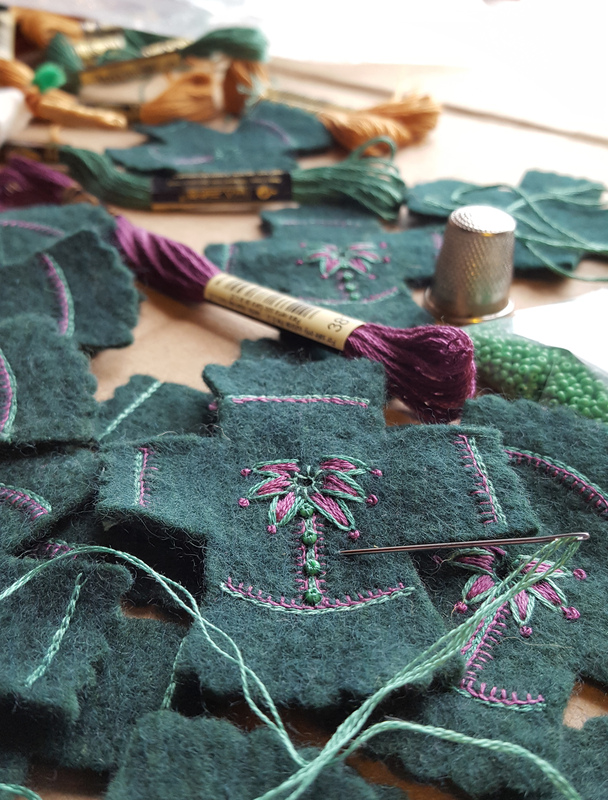 Jade’s wool felt tunic is hand embroidered. 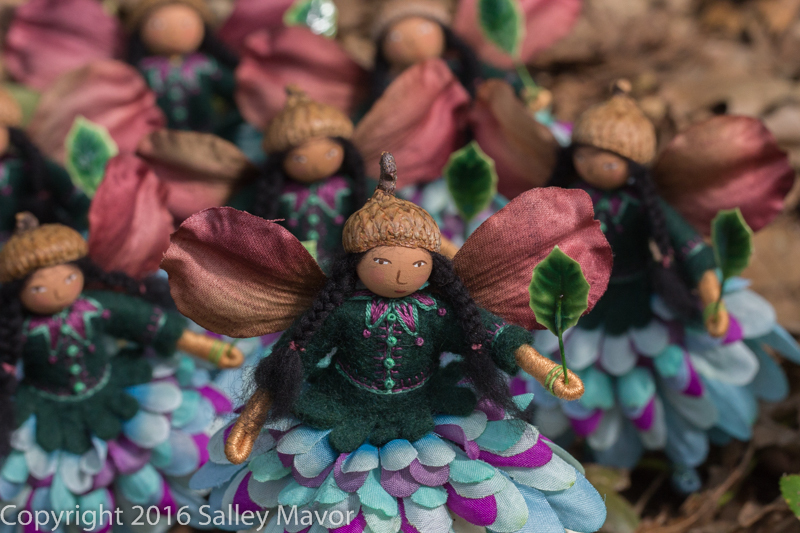 In an effort to be fair to everyone, I am announcing on this blog, Facebook and Instagram that 25 “JADE” fairies will be listed for $75.00 each, in my Etsy Shop on Saturday, Oct. 15th at 9 AM, eastern US time. That gives more of you a chance to read about it in advance, so you can plan on being ready to shop. I’m sorry if this hour isn’t convenient for other time zones around the globe, but I can’t figure out how to accommodate everyone. This sale will start an hour earlier than usual, so that customers in Australia don’t have to stay up into the wee hours, but it means that those of you on the US west coast will be setting your alarms earlier. The last edition sold out very quickly, so if you really want one, act fast! Sorry, no reservations ahead of time. 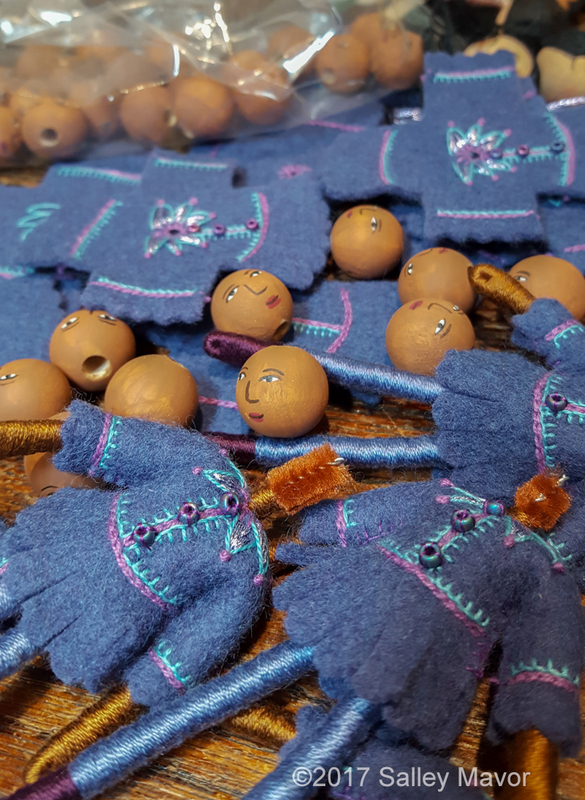 The dolls will be sold on a first come first served basis.